The near-term uptrend in the FTSE is being tested and in the case of some of the European indices you could argue that it's over. Nevertheless, this morning there's yet another attempt by the bulls to pick up the stocks that they believe have corrected too far. Yesterday's sell off was particularly sharp in the FTSE, when compared with the likes of the DAX and CAC, as the London market hadn't previously succumbed to the selling pressure and was probably ready for a pull back. Also see today's feature Are We Seeing an Escalation of Currency War? This morning the FTSE 100 is back around the 6300 mark, the index seems to have temporarily fallen in love with the level as it remains stuck in a bit of a consolidation phase. Having said that, the index continues to be better supported than its European counterparts, which saw another big drop yesterday, so investors seem to be favouring UK stocks over European ones for now. Also see today's feature UK to Remain Susceptible to High Inflation. A rebound in equity markets yesterday took US indices back to the highs of last week but European indices have been a little more reluctant to recoup the losses incurred on Monday. For those US stocks, the uptrend on the short-term Dow chart still looks very much intact, yet the 14,000 level remains a difficult hurdle to overcome. Yesterday's rebound was triggered by another round of better-than-expected corporate results which helped the index close 99 points higher at 13,979. The rally also came despite a miss in the ISM non-manufacturing figure, albeit a small one. At the same time, there was big news for Dell, the world's third biggest computer maker, which has agreed to be taken private. The rebound in stocks seems to be continuing this morning, with the FTSE gaining more momentum and moving back above 6300 at the time of writing. It looks like UK shares are keen to match their American counterparts by heading for the highs of the year, so the bulls will be aiming for the next resistance level around 6350. Also see today's update on the Libor Scandal. Considering the recent gains for US equities, investors decided that is was safer to book some profits and yesterday they pushed the Dow 130 points lower to 13,880. There was little major economic data out yesterday, but today things become a bit busier with the UK services PMI due at 9:30 London time. This is an important survey as the services sector makes up the lion's share of UK GDP and the last reading saw a big and unexpected drop below 50, suggesting contraction. This morning could see it move back up towards that 50 level, but expansion seems unlikely considering the tough weather conditions during January. As mentioned, the FTSE is on the rebound this morning and, at the time of writing, is trading at 6270. Interestingly, we would normally expect our spread trading account holders to be dipping their toes back in and buying the index following such a sharp decline. However, this time around, the balance is still leaning towards the bears. Also see today's feature European Stock Markets Fall on Spanish PM Corruption Claims. On Friday, the big US Non-Farm Payrolls data for January came in slightly weaker-than-expected at 157k, but what caught investors' attention were the upside revisions for the previous two months. In addition, other bits of economic data were a pleasant surprise, with manufacturing also beating expectations. Consequently, after a 150 point gain, the Dow Jones closed above the 14,000 mark for the first time since 2007. As mentioned though, this has not translated into strength for Europe this morning, with the FTSE 100 currently trading a little lower at 6330. To the upside, bulls will be closely watching the resistance around the year's highs near 6350. Also see today's feature Bank Shares Remain Unaffected Despite Potential Ring Fencing. The pause for breath seems to have been short lived as European markets are set to bounce following the previous two days of profit taking. With some slightly disappointing economic data and corporate earnings, investors naturally halted the buying frenzy; standing back for a while to review what has been a superb start to the year. It looks like the second month of 2013 is also going to start on the front foot, so it will be interesting to see whether the Non-Farm Payrolls can help the bulls test the recent highs. The US stock market indices continue to lead the way as they are marching towards their 2007 highs but the European markets are lagging behind. This probably represents the economic differences between Europe and the US at the moment, where growth is far more robust than here or on the continent. This is leading many investors to argue that European stocks are still undervalued when compared to their US counterparts. Yesterday, the Dow edged 50 points lower to 13,860 as investors in the US stopped for a breather ahead of today's Non-Farm Payroll figures, due at lunch time. The day saw a few corporate earnings miss estimates and this sparked some second thoughts about the health of the US economy, leading to the profit taking. Nevertheless, already this morning, we are calling the Dow to open higher by 40 points at 13,900. For Non-Farms today, the unemployment rate is expected to remain unchanged at 7.8%, with employers predicted to have added around 160,000 jobs last month. What will be really interesting to see is how the online spread trading markets reacts to the data. If the data comes in better-than-expected, we could see something of a spike higher or, if it comes in worse, investors may buy anyway as they foresee further monetary stimulus. This morning, the FTSE is higher at the open and back above the 6300 level, having erased all of yesterday's declines already. Several clients that had been largely short throughout January's rise came out of those positions in the couple of down days and have taken out a few tentative long positions. After yesterday's poor US GDP data, a little weakness has filtered through to the European session, with all major indices in the red. At the time of writing however, the FTSE is only off by some 15 points, taking it to 6310. As a result, the index is currently finding some near-term support from the previous resistance level around 6300. Earlier this morning, UK consumer confidence data provided a rare ray of sunshine as the figure came in better-than-expected, even if it is still deep in negative territory. The improvement matches those of other sentiment surveys which, after such a dire 2012, have shown a degree of optimism about 2013. Of course, we will have to wait and see whether that optimism proves to be short-lived following the poor GDP figure last week. Also see today's feature Spread Trading Markets Remain Firm Despite Poor US GDP Figures. Yesterday, US stock markets were driven higher by yet another round of better-than-expected corporate results. This time they were lead by Pfizer and Valero Energy as investors shrugged off those weak consumer confidence figures. Consequently, the Dow Jones came within touching distance of the 14,000 mark, finishing some 70 points up at around 13,950. Today, all the eyes will be on the Federal Open Market Committee meeting where Chairman Ben Bernanke's speech could bring a few hints on his next move. Despite the strength from US indices, our FTSE quote never really got much higher than last night's closing price of 6340. This morning, the index is just drifting a little lower, down 10 points to 6330, following those Spanish GDP figures. Clients have remained bearish and continue to sell into the strength, holding onto what has now become a rather long-term view that things must come off the boil at some point. There's a lot to focus on from an economic data standpoint today, with UK mortgage approvals this morning and then EU confidence shortly after. This afternoon, we have the monthly ADP private payroll data from the US and first reading of their Q4 GDP. As if that wasn't enough, there's also the FOMC meeting to look forward to later this evening. Also see today's feature Eurozone Markets Start to Look More Resilient. Despite the UK's deteriorating finances, the FTSE 100 seems to be carrying on regardless. Even though the index was unable to conquer the 6300 level by closing above it yesterday, it is currently trading above it on the open of today's session. The rally thus far in 2013 has taken even the most bullish investors by surprise as it has seen the FTSE soar into the stratosphere against considerable headwinds. Friday's release of the UK's Q4 GDP confirmed that the economy is flat lining and isn't exactly being assisted by current Coalition plans. For all their efforts to reduce our mounting debt pile and deficit, we've actually seen taxes increase and government spending rise. When you implement austerity to reduce your debts you are supposed to reduce government spending, not increase it. The rebalancing of the economy simply hasn't gone far enough. Considering all the economic difficulties and continued credit squeeze, the private sector is certainly doing its bit to create jobs and take up a lot of the slack. However, if the government implemented more radical growth measures to make it easier and cheaper to employ people, we wouldn't have to see such crippling tax hikes and we could even make deeper spending cuts. Throughout the previous government, the state simply grew too large and you only have to look at all the time wasting and inane decision-making to see that. With the debt pile rising and the economy continuing to show little indication that it is about to grow significantly, the UK can kiss goodbye to its triple A credit rating. Unfortunately, whilst a brand spanking new high-speed railway might be a good idea, there's going to be no short-term benefit for the UK. Onto the financial markets, and yesterday's US trading session saw another intraday record for the Dow Jones as investors lifted it to a five year high at 13,915. However, conflicting economic results in the US dented the newly found optimism and a push towards the 14,000 mark remained elusive. Whilst durable goods orders did rise, an unexpected drop in pending home sales raised the alarm about the housing sector. This has led to a flat to positive start for European indices, with the FTSE leading the way as it sits comfortably around the 6300 level. Our spread trading account holders continue to sell into the strength, lengthening their stops and awaiting the correction that never seems to come. For the bulls, the next resistance targets are seen around 6330/50/75, whereas the bears will be looking to break the downside support at 6260 and 6235. The Dow continued to rally on Friday, reaching its strongest level since 2007 and almost touching 13,900. The rise came on the back of renewed optimism about the health of the US economy, with most companies reporting better-than-expected results. This was the sixth straight gain for the index and, with the bulk of earnings due this week, if we continue to see good figures the upward momentum may be maintained. Around a third of S&P 500 constituents have already reported, with some 20% due to report this week. There are also lots of PMI survey's due, central bank interest rate decisions, consumer confidence data, an FOMC meeting and then the Non-Farm Payrolls on Friday just to finish things off. The FTSE is taking things in its stride, trading flat to negative around the 6280 level, as investors take stock of the gains seen until now. Many are likely to wait for some of the earnings and data releases before deciding if the rally can go any further. Also see today's feature Is the UK in a Japanese Style Lost Decade? A rebound in stock markets yesterday took US indices back to the highs of last week but European indices have been a little more reluctant to recoup the losses incurred on Monday. For those US stocks, the...» read more. The FTSE spread trading index opened lower this morning but we have already recovered from a low of 5711, so it would seem that there are still a few bulls around, even after yesterday's big move higher. For technical analysts, the rally was a very bullish...» read more. 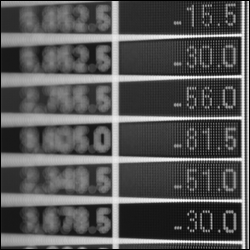 Stock market spread trading investors got a wake up call yesterday, with a sharp sell-off that saw the FTSE wipe out the hard work it had put in to get back above 5900. In the case of the DAX 30, its 2.1% decline was enough to send the index below...» read more. The Dow Jones index spread trading market came under some pressure, recording a triple digit decline, as a statement by Philly Fed President Charles Plosser suggested that unlimited QE3 won't spur economic growth or bring down unemployment as much as...» read more. Global equity markets have been staging a rally that has caught many people by surprise and it's the US markets that are leading the way. The Dow Jones rallied sharply on Friday, as the Non-Farm Payroll figure...» read more. The Dow Jones managed to put in a half decent gain last night and Asian indices complimented that so European indices are just about in the black. Once again however we had been calling the FTSE to open much higher. At one point in the early hours, our quote reached...» read more.